Bratislava, the capital city, lies at the strategic crossroads between Budapest and Vienna. In the 10th century, it was part of the Kingdom of Hungary. In 1536, what is now called Bratislava became the new capital of Hungary or the Austrian Hapsburg monarchy. WWI brought the collapse of that Empire, and the city became part of Czechoslovakia under Russian rule. Slovakia declared its independence in 1993, and joined the European Union in 2004. Travelers are pleased to find they use the Euro. Before the Viljhalm reached Slovakia, the Longship needed to pass through a series of modern locks, the first one the largest. The locks are new – – Stalin didn’t want to open the Danube as an escape route to the west and freedom. Progress was like watching grass grow. Way too slow to keep the attention of most. Viking offered an educational video to explain the process and views of what goes on in the wheelhouse – where and how the captain steers the vessel. The excursion to Bratislava started with a bus tour to the highest reaches of the upper town. Unfortunately, the bus was not permitted to stop so we couldn’t see much of the spectacular view. We passed a partially obstructed mansion that looked like a small version of the White House. 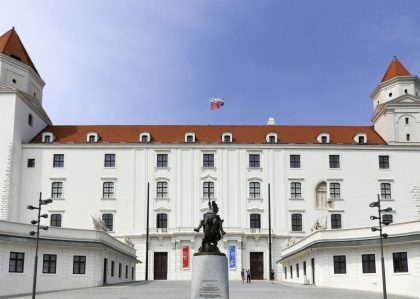 Grassalkovich Palace is actually Slovakia’s White House, serving as the official seat of the President. We caught a brief glimpse of the Slavin War Memorial surmounting a hilltop surrounded by a cemetery. It commemorates the city’s 1945 liberation from the Nazis by the Soviet Red Army, and provides the final resting place for nearly 7,000 soldiers who died in that effort. The bus made its way down to about mid-point, where we jumped off at the Bratislava Castle. The town icon perches on a cliff looming over the lower city and the Danube. The white stucco palace has four large towers and red accents, but commands an austere presence. No Hapsburg royal flourishes adorn the structure. It dates from the 1950’s,fire destroyed the original in 1811. We were not allowed inside. A curious bridge, built in 1972, spanned the river — an asymmetrical gray Soviet era construction. A discus-shaped tower resembling the Enterprise from Star Trek tops its pinnacle. Today you can beam up there to a restaurant and bar appropriately named UFO. So far, I was disappointed, I wanted Bratislava to be more. Thankfully the day was still young. I soon discovered what I was hoping for. As we neared the Old Town, we passed through St. Michael’s Gate, a tower that just oozed Old World Charm. We walked through the archway in the gate and proceed down a slight grade. We began passing pastel colored Baroque palaces – think buttercup, lavender and mint hues. Onion-dome turrets and spires rose above the cobblestone path lined with lively bistros and signage. Arriving at the main square brought a soaring clock tower, Old Town Hall. A cannonball embedded in the façade memorializes a siege by Napoleon. Many arched entries and narrow passageways worm their way through the idyllic scene. Buildings constructed from different architectural periods magically blend together, like a small version of Prague. 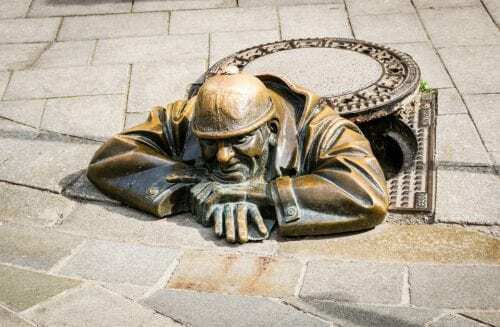 A favorite site for all the old town’s visitors comes in the form of, believe it or not, a manhole-cover sculpture. Cumil or “the Peeper” as locals call the odd fellow. He offers a little Slovak humor. In the square, a man with a many-armed wand sent hundreds of bubbles into the air – – children madly chasing them and bringing smiles to all. The outdoor cafes and bistros jostle against each other making for a bustling and lively scene. Enticing aromas of sausage and beer filled the air. Seems everyone was caught up in the joyous spirit, not only the group of Brits celebrating a bachelor party. Our walking tour ended at another square with a name I can’t begin to pronounce. The impressive Slovak National Theater building acts as the anchor. We had the option to follow the guide back to the ship or enjoy free time. We stayed on to sample a pint of Slovakian beer, in my opinion, excellent. We meandered around the outdoor kiosks, mostly selling souvenirs, and paused at St. Martin’s Cathedral, a vast Gothic church that was consecrated in 1452. Depending on your source, anywhere from 11-18 monarchs were crowned there, including the Hapsburg Empress Maria Theresa. We returned to the ship delighted that the hodgepodge of buildings. The vibrant atmosphere in the Old Town let loose the heart of the place. Bratislava is a hidden gem, some of its jewels are authentic, and some just pretend. Go see for yourself – – you might like both. Alaska cruise on the Chichagof: Where is my luggage?